In my last HGWT blog post I started telling you about my trip with my wife Nicki to Orlando, FL and The Wizarding World of Harry Potter. 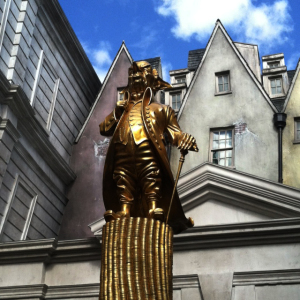 Our first Harry Potter experience at Universal Studios was the “Escape From Gringotts” ride in Diagon Alley. 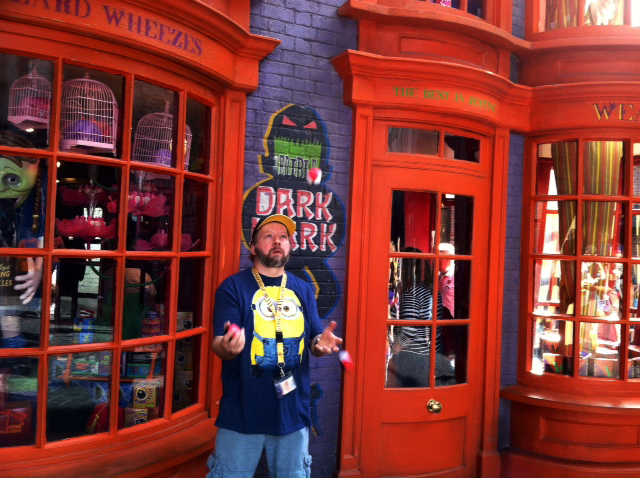 This time around I wanted to go into more about what else we experienced in that section of the park- especially the shopping and storefronts. 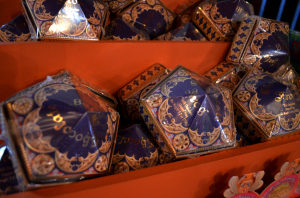 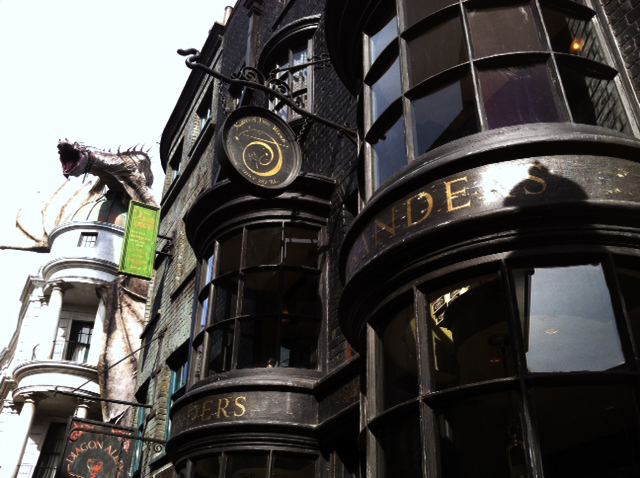 I had two favorite shops in Diagon Alley– Ollivander’s Wand Shop and Fred and George Weasley’s shop Weasleys’ Wizard Wheezes. The attention to detail on both was incredible. 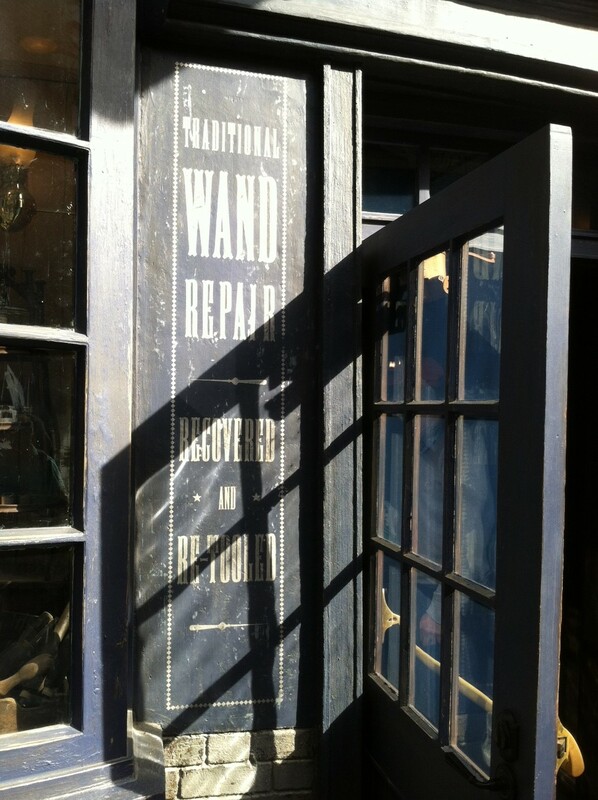 If you wanted a specific character’s wand, or a product seen in the Harry Potter movies they seemed to have it! 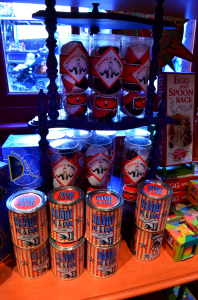 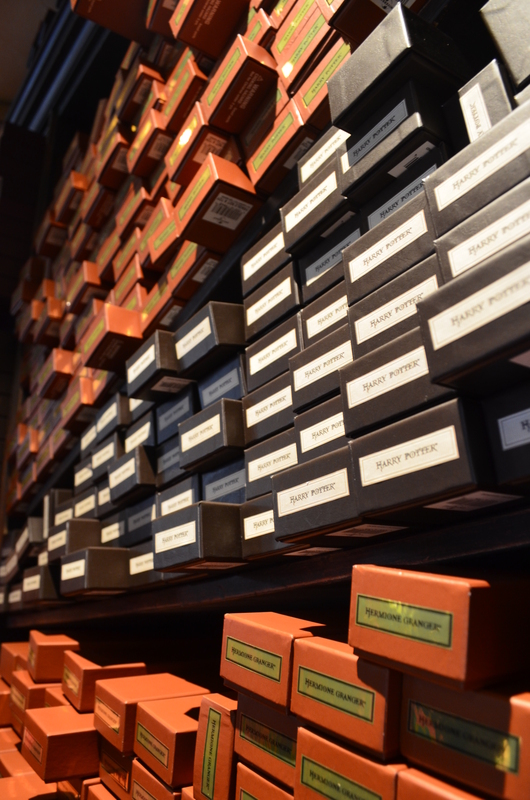 There were a few wand shops and kiosks around the park, but we decided to shop for our wands at the main Ollivander’s shop in Diagon Alley– and I’m glad we did. 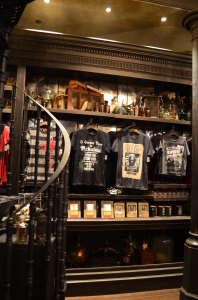 The shop was a bit tight and could get crowded at times while we shopped, but when we got to Hogsmeade later there was a line to get into the Ollivander’s next to the Owl Post there! 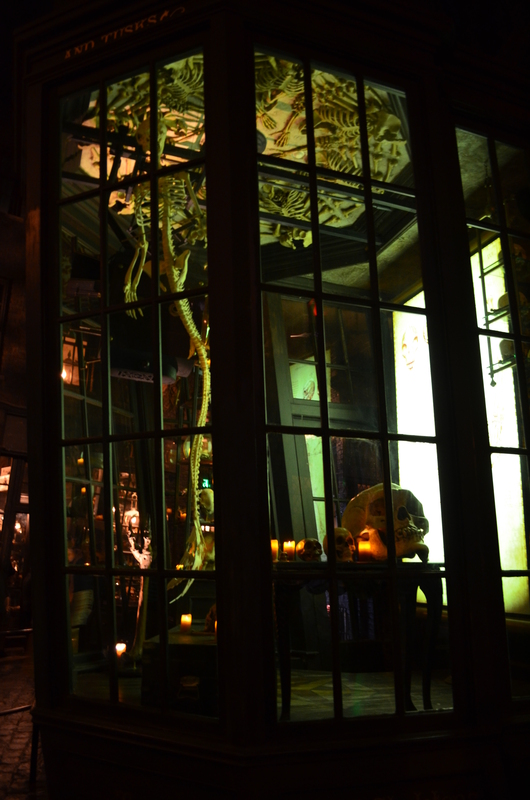 At least we could just walk right in at this location. Even though it was a small shop, the selection of wands was a bit overwhelming. 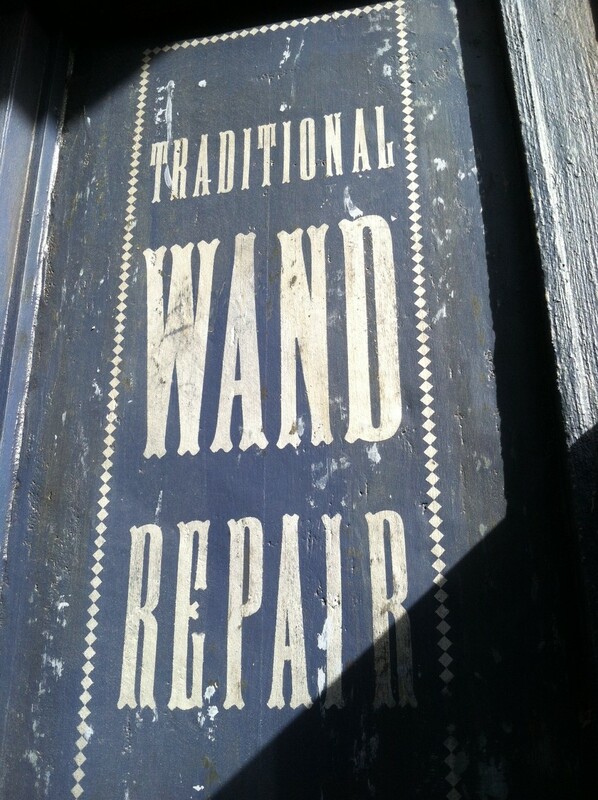 They say “the Wand chooses the Wizard“, but here you can pick your own. 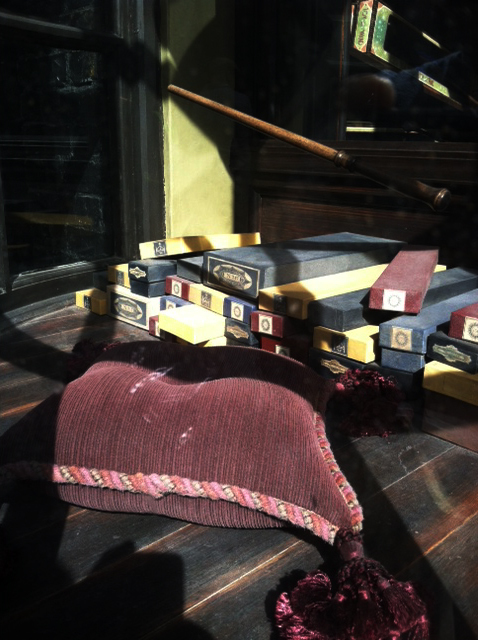 We could have ordered some when we got back home, but it was nice and really cool to see them in person and buy them from Ollivander’s. We spent a good time looking through the stacks of boxes on multiple shelves and probably could have used some help from a wand. Luckily there were a few displays on the walls and helpful store employees to help with selecting the perfect magic wand. 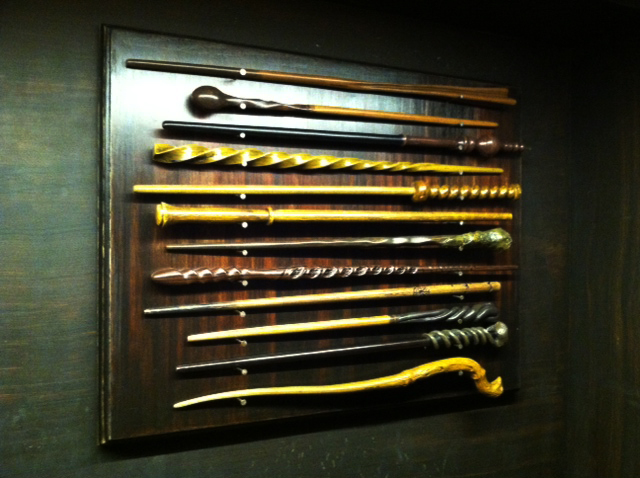 Some of the detail on the wands were not only breathtaking, but really fit the characters they belonged to- especially Slughorn’s! 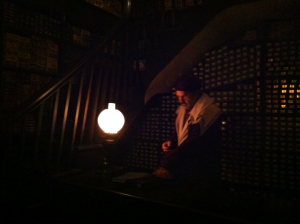 Some characters also had more than one wand to choose from. 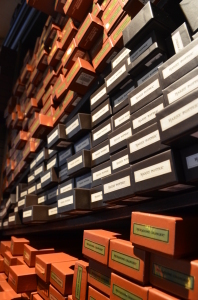 If you needed additional help you could walk next door and down a long hallway flanked with wand boxes to attend a wand choosing ceremony in the back of the wand shop. 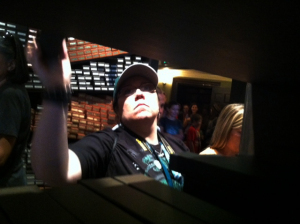 We attended the “Ollivander’s Interactive Experience” twice that week- once we just watched someone else choose their wand with the help of this Ollivander’s wand expert. 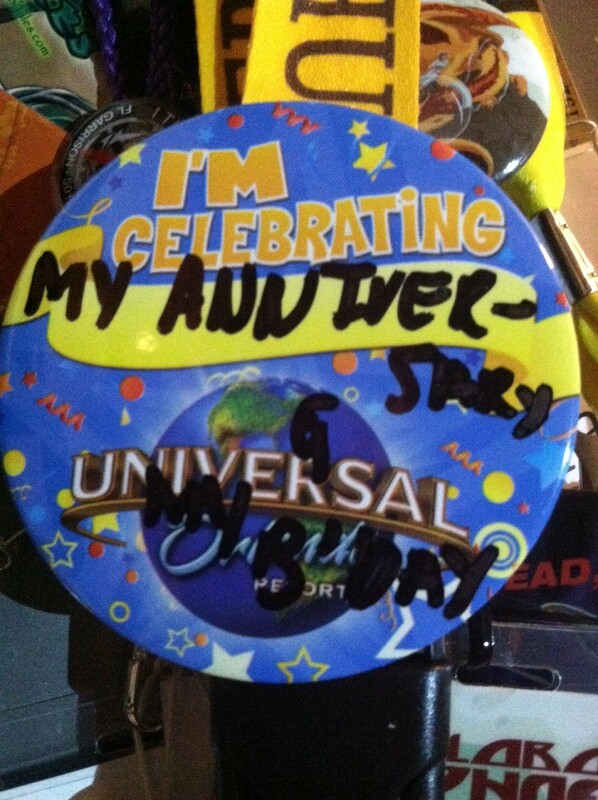 The next time Nicki and I both were chosen to participate (could have had something to do with the birthday/anniversary buttons we were wearing). We got to make bells ring, flowers wilt, and lightning/thunder crack. 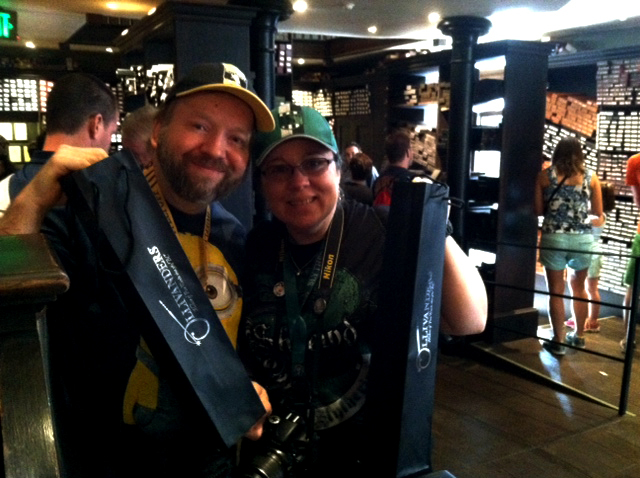 It was actually a lot of fun and glad we were chosen to be a part of the entertainment. You could choose between regular wands and interactive wands (I’ll go into more detail on them in my next post). We ended up with one of each for the both of us! 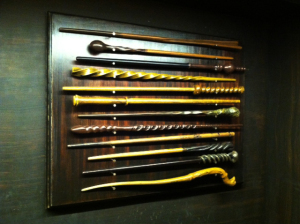 The regular ones we chose were a Ginny Weasley wand for Nicki, and a Rufus Scrimgeour one for me. The interactive wands that chose us were a George Weasley wand, and a Dolores Umbridge wand. Luckily all four of them survived the flight back to our home safely. Next to the entrance to Diagon Alley is a bright orange building that is the home to Weasleys’ Wizard Wheezes. 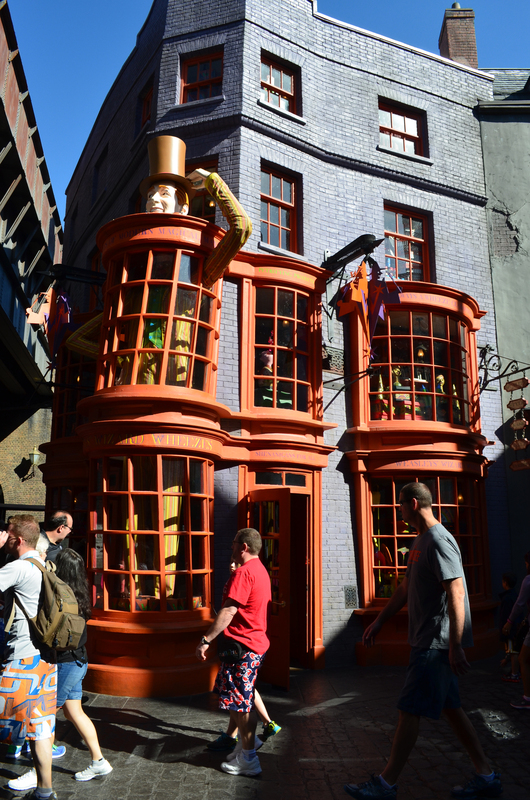 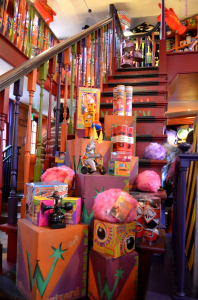 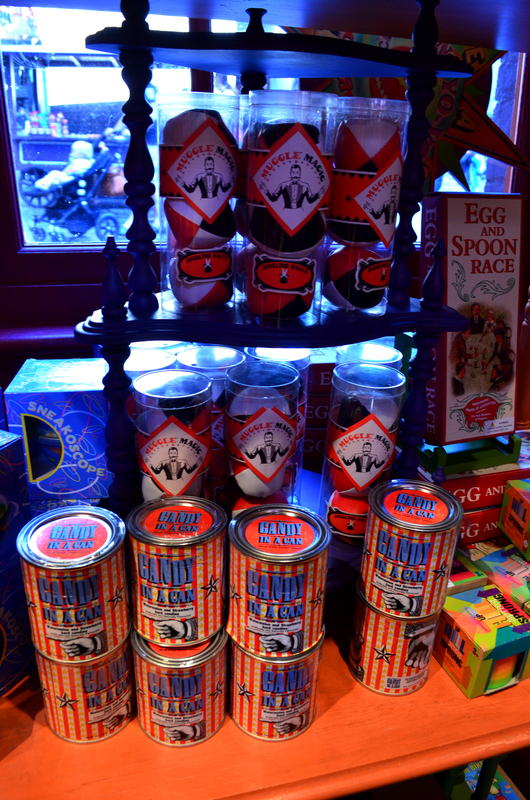 It’s a joke and novelty shop founded by twins Fred and George Weasley. “WHY ARE YOU WORRYING ABOUT YOU-KNOW-WHO? 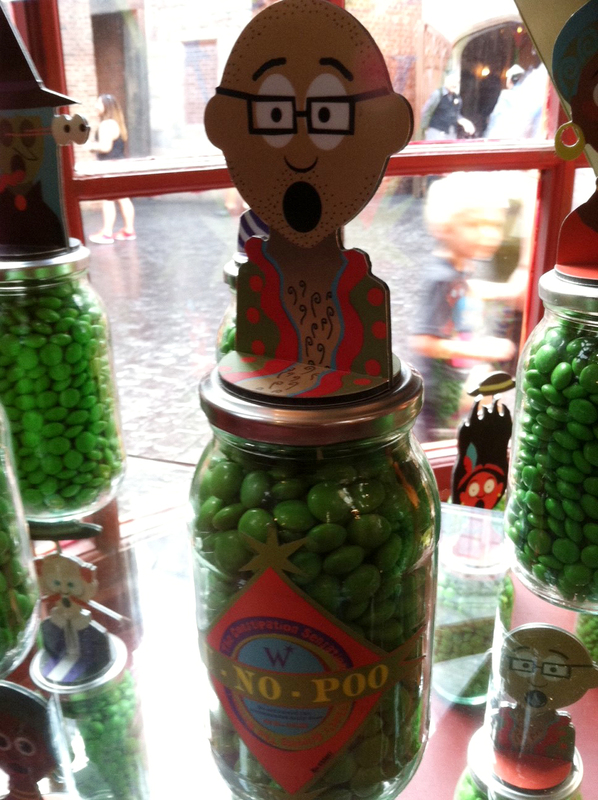 ..as well as tees, pins, buttons, and Muggle Magic Tricks. Nicki got some chocolate frogs (each came with a Salazar Slytherin lenticular trading card). I picked up some buttons, pins, and juggling balls. 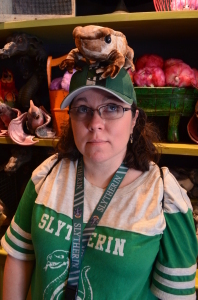 Yep, I juggle- just not professionally. 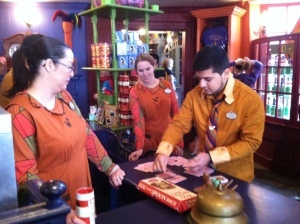 One of the staff was performing magic tricks at the counter for fellow employees and shop customers. 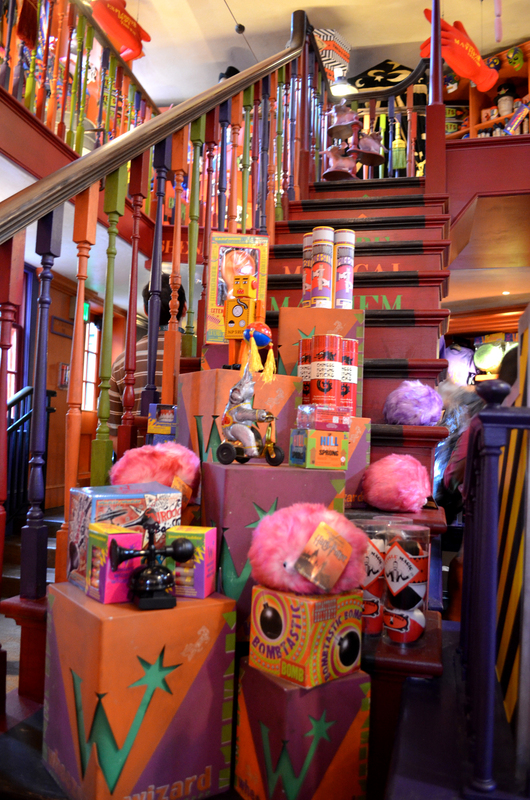 We also witnessed someone adopting one of the Pygmy Puffs. 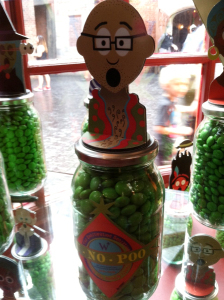 I just wish the shop was a wee bit bigger, or at least the upstairs was open. I know London shops are supposed to be a bit cramped sometimes, but I wanted to explore more! I did have a lot of fun shopping there, and enjoyed visiting the Quidditch shop next door, too. It was connected and you could walk from one to the other without having to go back outside. 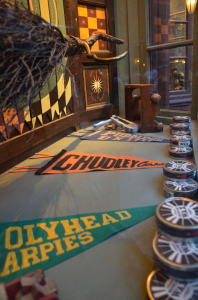 I really liked the house scarves and Quidditch equipment. 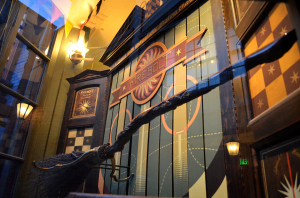 There was an awesome moving team photo on one wall near the entrance which featured a player on a broom buzzing the team. 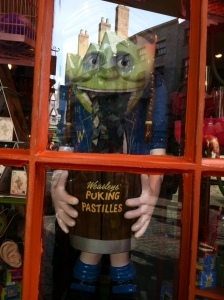 Pretty funny. 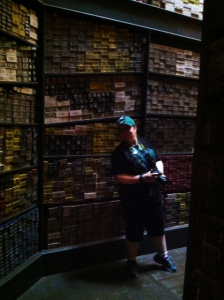 There was a photography shop on the other side of the Weasley’s shop, but I didn’t go in there. 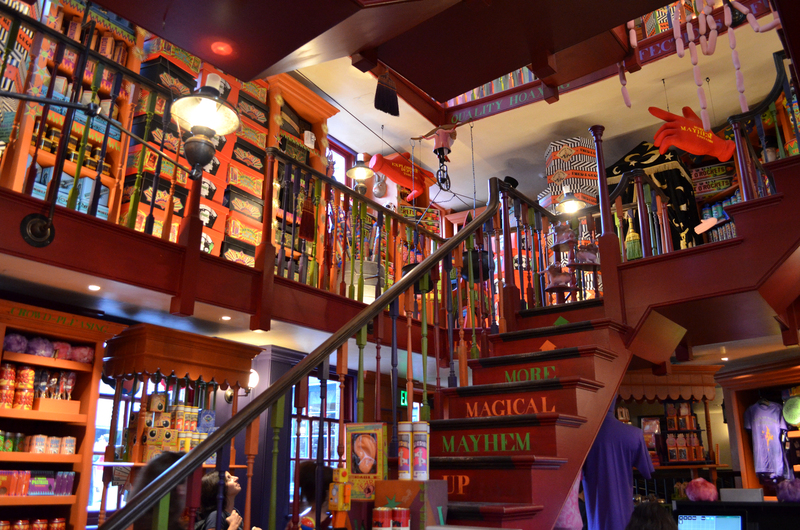 One of the other shops I had a lot of fun in was The Magical Menagerie pet shop. 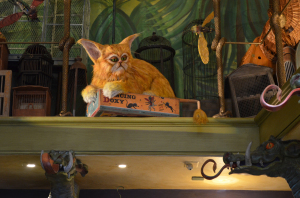 There were plush magical animals for sale, and a few “live” animatronic ones on display. This is where we got our “Celebrating” buttons from the store clerk. 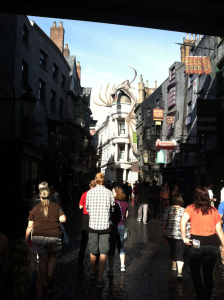 Nicki made a friend while we were shopping there, and I finally got to see what a Chinese Fireball dragon looks like! 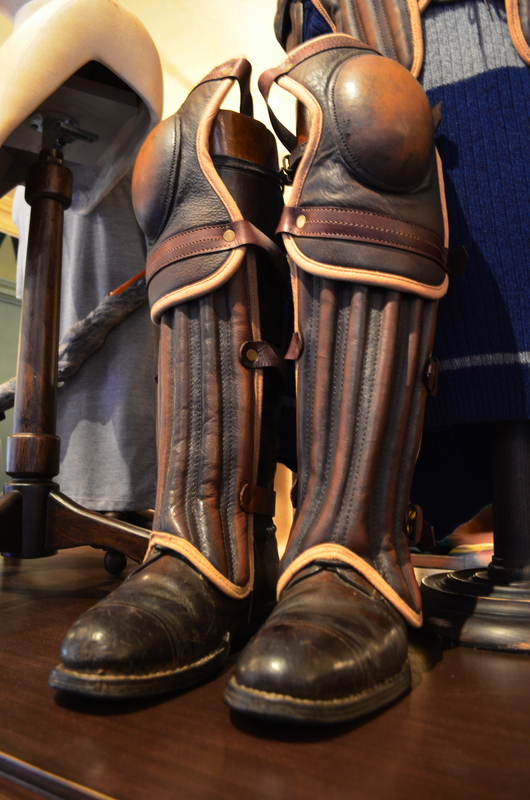 One of the prettier shops (and one I wish I could have spent more time in) was Wiseacre’s Wizarding Equipment. 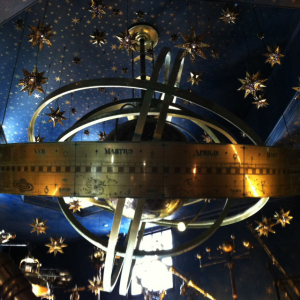 I really loved the brass looking telescopes and other equipment. 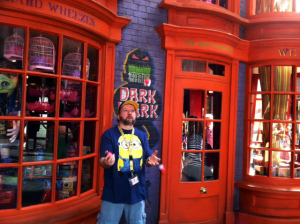 They had some items I wish I had remembered to go back for on our last day there, but got in a hurry and only got a Hogwarts Express toy train. 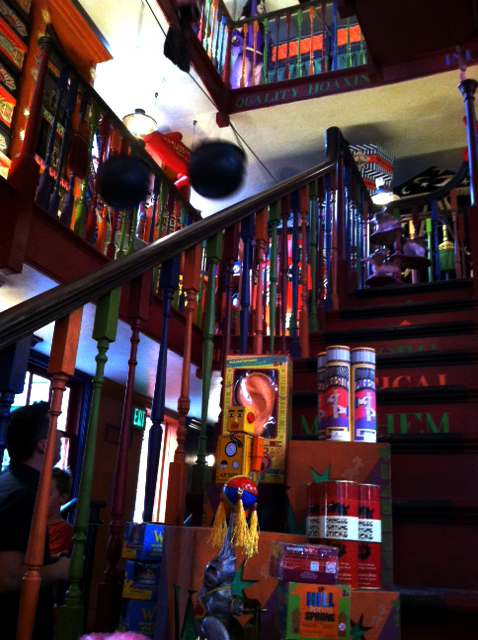 Definitely will shop there again. 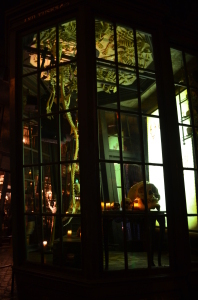 You’ve heard of not wanting to meet someone in a dark alley– well, we took our chances and went shopping in one when we ventured into Knockturn Alley. 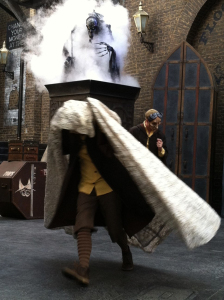 Lots to see- well, as best as someone could in a dark alley! 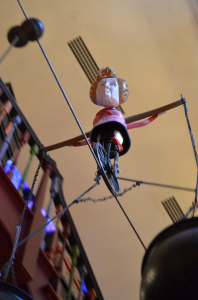 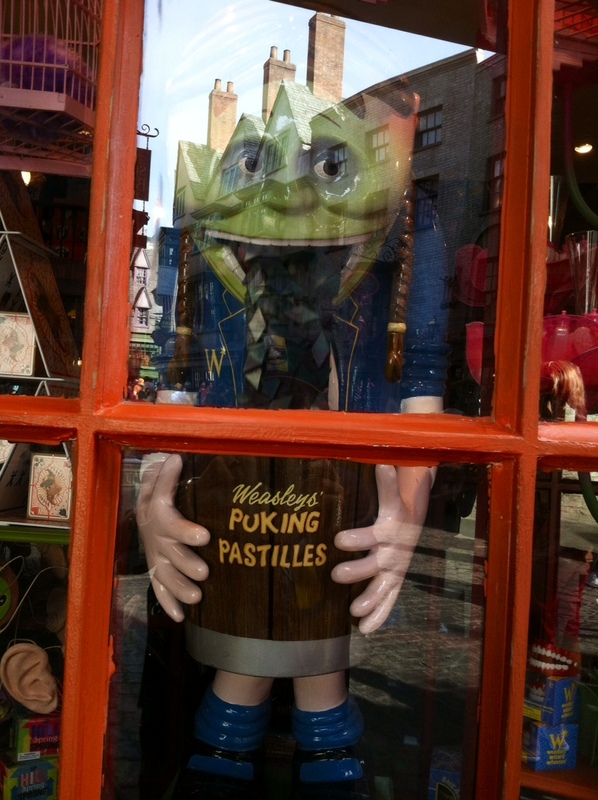 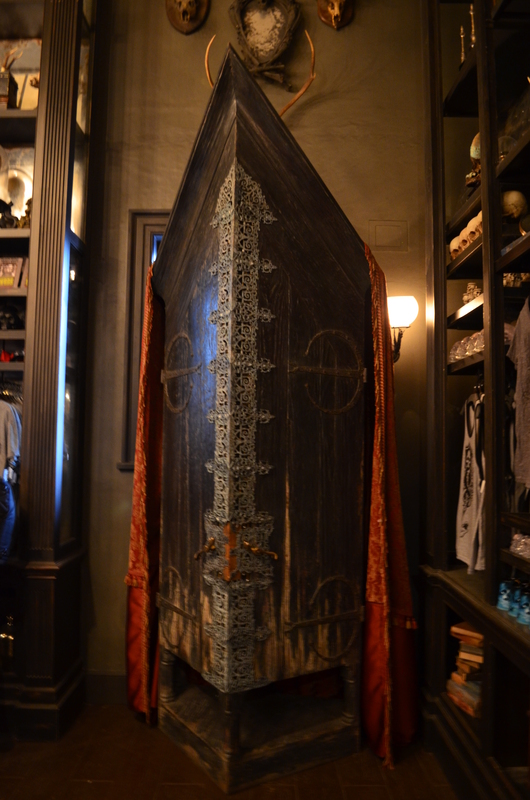 A lot of creepy items on display, and some not so creepy for sale at Borgin and Burkes. 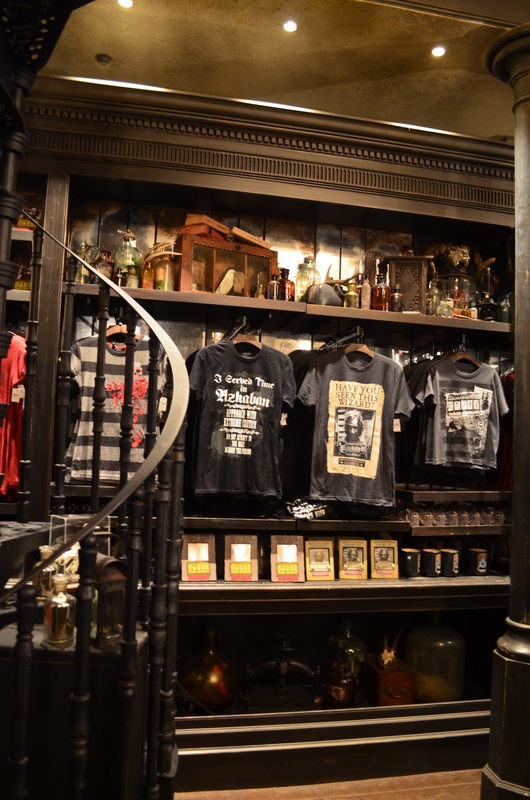 Lots of Sirius Black, Bellatrix Lestrange, and other Prisoner of Azkaban tees, photo frams, and other merch. 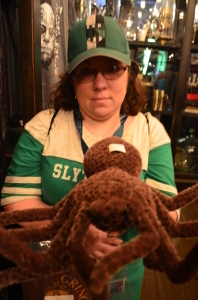 Nicki and I dug the stuffed Aragog/Acromantula, and of course there was a vanishing cabinet! 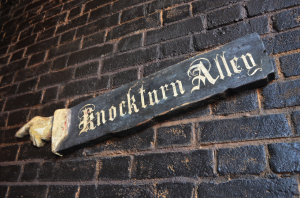 Speaking of vanishing- this is where I’m going to disappear until my next blog post when I let you in on some of the food and entertainment we experienced in Diagon Alley!